These yellow smiley car windshield banners have a smiley face on the left and right side. $1995, $2995, $3995, $4995, $5995, $6995, $7995, $8995, $9995, $10995, $11995, $12995, $13995, $14995, $15995, $16995, $17995, $18995, $19995, and $20995. The banner has a blue background with a flame at the bottom going left to right. The numbers are in yellow with a strokes to help them text pop. 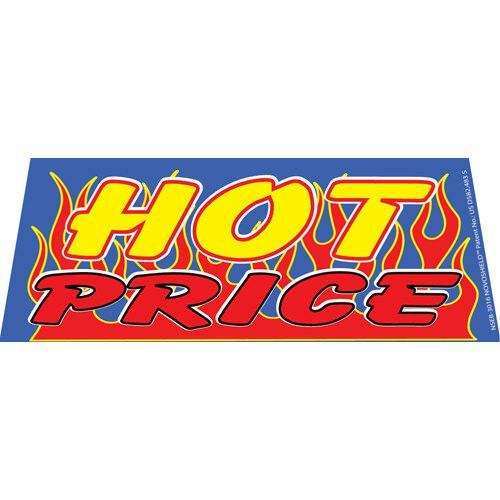 Under the number, it has the text “Hot Price.” The outlines allow the text to pop, which make the banner easily noticeable and readable from a distance. There will be a bungee type cord on the left and right sides of this windshield sign. Bungees can easily stretch to wrap around the side-view mirrors of your vehicle. 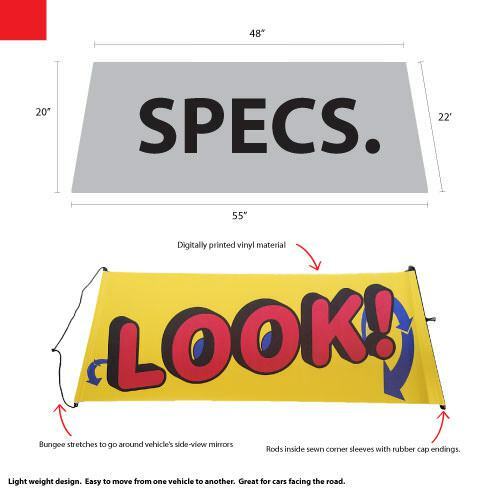 The windshield banner can be moved from one vehicle to another. 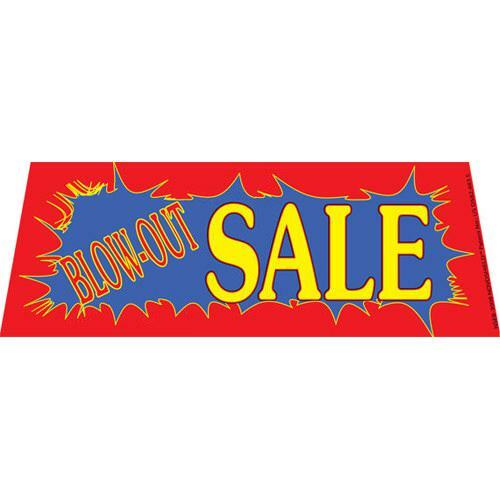 Use this vinyl windshield banner with our other products — which include include feather banners, swooper flags, square flags, 3×5 flags, window clip-on flags, and other car-lot promotions. 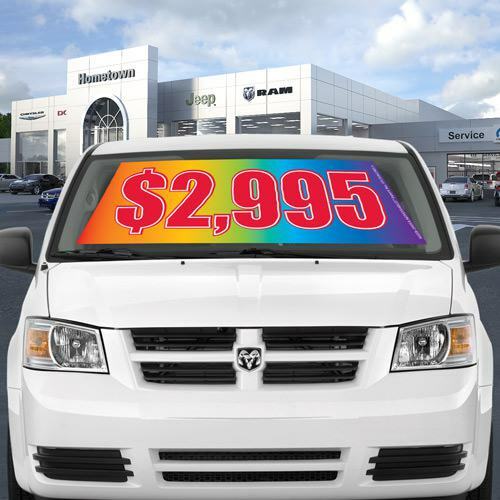 Visit the auto dealership item page by clicking here. Custom prints allow you to create a customized design to advertise to a particular audience or sale. Great for the many holidays throughout the year! Our printing process is digital, therefore you can use unlimited colors, company logos, and live images. 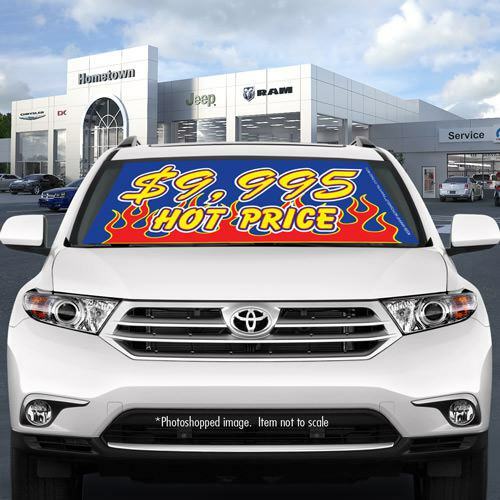 Custom windshield banners are highly advised for any branded dealership.